Successfully Added JJRC H37 Mini Baby ELFIE Camera Drone - 720P FPV, Smartphone App, Joystick Control, Folding Design, Altitude Hold, Headless Mode to your Shopping Cart. Compact mini-drone folds to fit in your pocket. The new JJRC H37 Mini Baby ELFIE Camera Drone is a compact FPV quadcopter that can fit in your pocket. 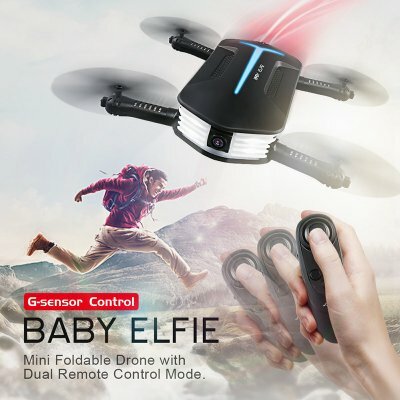 This new drone is smaller than the original Elfie, has the same sunning high resolution camera, a new easy fly joystick control and best of all is the cheap price. This drone has a 720P FPV camera for high res pictures and video. Its folding design and carry case allows you to carry it anywhere without any hassle. The Elfie drone has a headless flight mode as well as trajectory mode and can be controlled via an app on your smartphone or the remote control joystick. The one-handed remote control has a joystick that allows for easy take off and landings with a sing tap. A throttle button lets you switch from high or low speed while the and the joystick makes it easy to control pitch and yaw. With its built-in gravity sensor you can tilt the controller in your hand to trim the drone's movement, so by leaning it forward or tilting it backward, you will adjust the direction of flight. Likewise tilting left or right will move the drone in that direction. Moving the joystick itself lets you rotate left and right as well as control ascend and descend. The altitude hold will do the rest keeping the drone stable in flight. By paring the drone with your smartphone you can see the FPV camera feed and can take high res photos and video during flight. You can even set waypoints to map out your flight in advance. This mini selfie drone is will let you take to the sky's and experience the sensation of flight while capturing it all on HD video. It comes with a 12 months warranty, brought to you by the leader in drones and quadcopters as well as wholesale electronic gadgets.. I highly recommend buying on this site, thanks Chinavasion!